This quilt, called Quasar 45, was inspired by the book, Accent on Angles, by Susan Purney Mark as well as a package of Blank's Fabrications 2.5" precut fabric strips (colorway: Sunset Strip). This quilt will be hanging in the Blank Quilting booth at this year's Fall Quilt Market in Houston, TX, October 27-29. 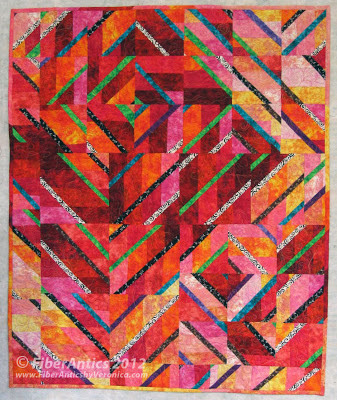 Quasar 45 will be at the Blank Quilting booth at Fall Quilt Market. Sunset Strip, with a vast selection of colors from the warm portion of the color wheel, is one of the three Fabrications strips (and Fat Quarter) colorways from Blank's ever-popular Splash blender collection. Prairie Wagon, a set of light and cloudy-sky blues, soft meadow greens and a sprinkle of earth tones, and Sea Level, a spectrum of ocean blues, sparkling purples and lush greens are the other two color companions in the trio. Accent fabrics in Quasar 45 include selections from Fusion Illusion, another popular blender, and Honeybell, a fabric line that is new this fall. With pre-cut Fabrications strips, you just open the package and you're ready to start stripping! Left-over pieces and strips were used for the binding and it was free-motion quilted with two colors of variegated 40 wt. cotton threads. (Yep, I change threads if the quilt calls for it.) The finished size is 36" x 44" but with additional Fabrications, it could grow to any size. I've shown this quilt (and the quilt top prior to quilting) to my students in recent quilt classes and there was definite interest in a future quilting class based on this project. I hope you are inspired by Quasar 45 and will join me in a class! Visit your local quilt shop to pick up an assortment of Blank's Fabrications 2.5" strips or other pre-cut fabric collections.